Neil Patel’s Top Ten Rules of Success: Just Go Do It — Helping you get found, get liked, and get more business online. NEIL PATEL WORKS … and he works hard. Ask him the secret to success, and you’ll get a speedy response: Go and do it. Neil Patel doesn’t mess around. Consequently, his Crazy Egg, KISSmetrics, and Quicksprout internet companies are wildly successful, and Neil regularly helps brand name companies make sense of internet marketing. Neil grew up in La Palma, California (Orange County). His parents immigrated to the United States when he was a toddler (couldn’t stand the weather in London). His dad was a hard working laminator, but it was Neil’s mom who watered the seeds of entrepreneurship. Early on, Neil knew two things: He wanted to become wealthy, and one can never get wealthy by working for someone else. He launched his first business in high school, but chose the wrong product (CD’s and “Black Boxes” that may or may not have been on the right side of the law). That turned into Neil’s first rule of success: Always sell something legal. He sold vacuum cleaners door-to-door, tried and failed at going head to head with Monster.com, and finally hit pay dirt with his internet marketing consulting firm, ACS. Along the way, he discovered another crucial axiom: Always make it easy for folks to give you money. 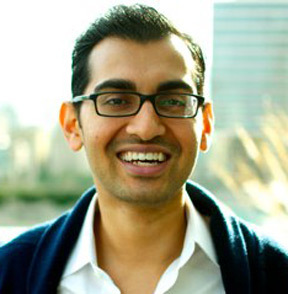 Of course, for a git-er-done guy like Neil Patel, success always rolls back to one principle: Don’t mess around. Don’t think about it. Don’t read about it … Do it! One more thing he saw, with that first success, was the importance of doing something you like to do. Work is no fun. If you are pounding it out day after day to make money — but you aren’t enjoying the process — something is wrong. Time is money. Move as fast as you can. No excuses. You have all the money and time you need, if you’ll try. Creativity is essential. Don’t follow the crowd. Optimize for conversions, not for traffic. Did you catch #3, by the way? Don’t make the classic internet marketing mistake and focus on how many visitors you are getting rather than on what they are doing on your site. If your traffic isn’t producing something of value to your marketing efforts, it’s being wasted. Neil Patel’s secret for making sales (don’t miss this) … find out what your customers want, then provide it. Make sure your product or service is truly valuable and aboveboard. Make it easy for people to pay you. Never stand in the way of an order. Stop thinking about it: Just go do it. Move quickly. Get stuff done. Don’t waste precious time. Make no excuses. Either you will do it or you won’t. Don’t worry about being perfect. Produce, don’t deduce. Be creative. Don’t worry about what everyone else is doing. Take risks. Sales are more important than traffic. Optimize for conversion, not for visitors. How to succeed in business: Find out what people want, and make it available. Love what you are doing or do something else. Your work should be your joy. Some people, you can visit with for an hour or two and be hard-pressed to come up with a take-away – something you are compelled to write down and hold on to. Not so with Neil Patel. Maybe Nike beat him to the trademark, but I’ll bet Neil had the idea first: Just (go) do it. Good ones, Fadi. Thank you. I am a big fan of Neil’s work. His writes his power packed ideas with such ease that one would wonder how deeply does this guy know his job? Thanks for sharing this Don!!! Neil is a pro, Preeti … and a very hard worker. Think of it this way, ggSolutions123: If Adsense is your concern, you don’t make money unless someone clicks on an ad … and that (to you) is a conversion. Neil is right in line with another marketing guru, Theresa Baiocco. Both are strong on that point: If your traffic isn’t leading to conversions, it may be good for brand-building, but has no direct effect on the bottom line. Moreover, if traffic is high and conversions are low … what’s wrong? Why is that?